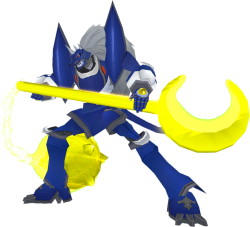 MirageGaogamon (Burst Mode) is a Beast Knight Digimon whose name and design are derived from "Mirage Gaogamon". It is a MirageGaogamon that has temporarily reached the limits of its abilities through Burst Digivolution, and wears a weapon and an aura of planetary-class high-energy. Concentrates your energy into a huge mace and uses it to attack the opponent. Draws power from all over your body and shoots it at the opponent.